Apparently, it had a 2.8-inch blade made from 425 modified cryogenic quenched steel. I assume it was the steel and cryogenic process that made this knife so innovative. If anyone has any more information, let us know. A Soque River version of the knife. The Lev-R-Lok is a really interesting design that’s still around. 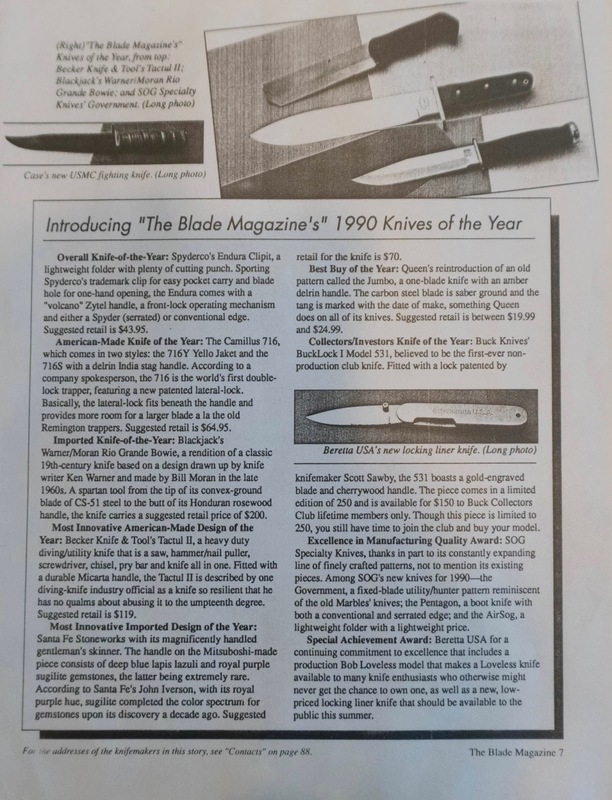 At the time, the knife was marketed by Soque River before Camillus (which owned the design) started producing it under its brand. 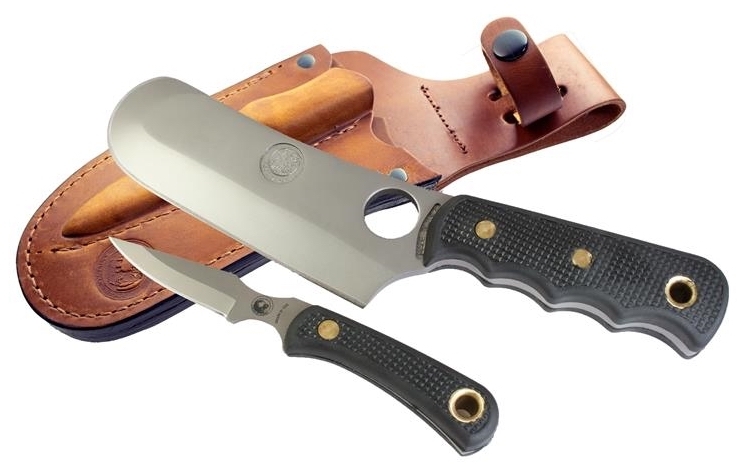 This is a combo set with two knives — a skinner cleaver and a caping knife. It is meant to be a complete field dressing system. 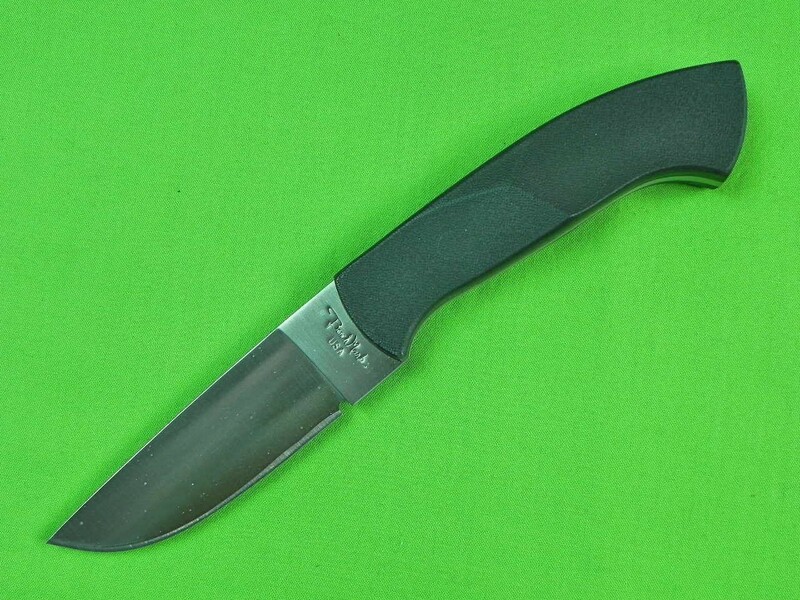 The knife was the first developed by Alaskan outfitter and bush pilot Charles Allen, according to Knives of Alaska. The rounded Alaskan Ulu design was an interesting choice. I don’t know too much about the Benchmark Feather Mate Sharpee. I believe Benchmark was first created by Blackie Collins before changing hands a few times. This knife apparently had a sharpener within the handle, which you could unscrew with a Philips screwdriver. 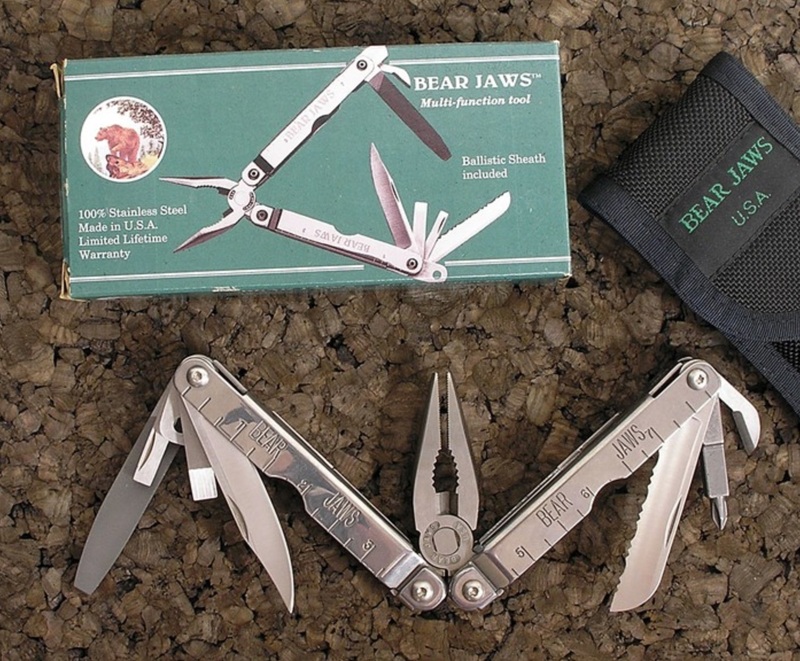 From what I could find, the Bear Jaws was a direct take on the Leatherman PST with one major difference — you could open the tools when closed. This was (and remains) an excellent idea. 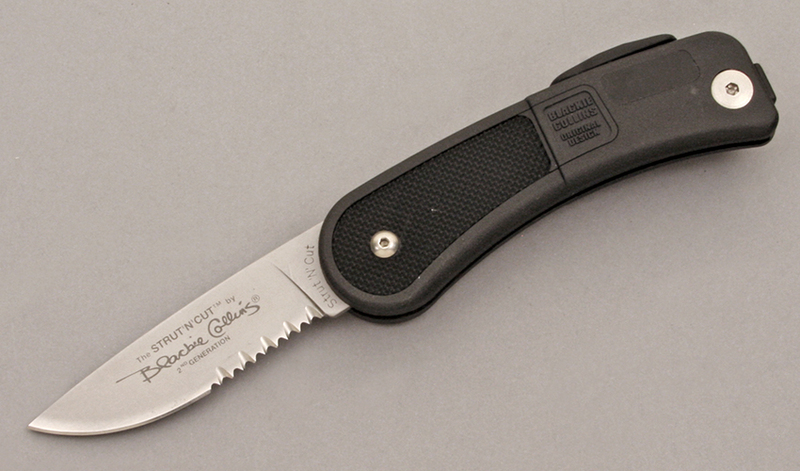 Bear MGC was eventually bought by Victorinox, which used the knife as the basis for the SwissTool. The company is now back in the hands of Bear & Son Cutlery, which still makes the Bear Jaws. Ken Onion is frequently credited as the creator of the assisted-opening mechanism, but others say Blackie Collins was the first. The truth is that they likely made their respective mechanisms concurrently. 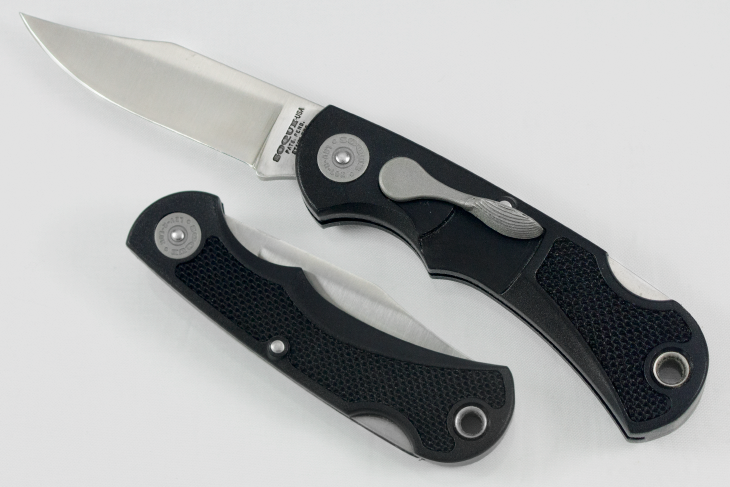 Collins’ knife was called the Strut’N’Cut and it won Most Innovative American design in 1997 for being the first assisted-opener. The knife was actually pretty clunky, but it was definitely revolutionary. The Camillus CUDA, also known as the Camillus Ultra Design Advantage, was another knife ahead of its time. It has a quick-opening mechanism without being considered an auto. These knives are still around. The SpeedTech Synergy was also ahead of its time. These knives were pricey in 1999 dollars (about $200 if I recall correctly), but they had one-piece aluminum frames, blade grinds done by Allen Elishewitz, button locks, and excellent fit and finish. I believe SpeedTech went out of business not long after. Gerber built upon the plier multitools of the past with spring-loaded pliers and tools that open when closed in the Gerber Multi-Plier 800 Legend. What this knife did that was new, however, was create replaceable tungsten carbide wire cutter inserts. This helps the longevity of the tool. I had the most trouble finding this knife. The TiNives BayoKnife was a different take on the bayonet that was designed to be a bayonet and regular fixed blade that screws on over the rifle barrel. The bullet actually passed through the knife. Here is a bonus image sent by Blade Magazine. TiNives — like SpeedTech — came out with some truly amazing and advanced designs. The company won the manufacturing quality award in 2002 but went out of business a few years later. This was an interesting knife from Phantom Knives that was marketed as one of the fastest deploying knives in the world. It would sit on a chain around the neck, but when you pulled it, it would deploy almost like an OTF auto. 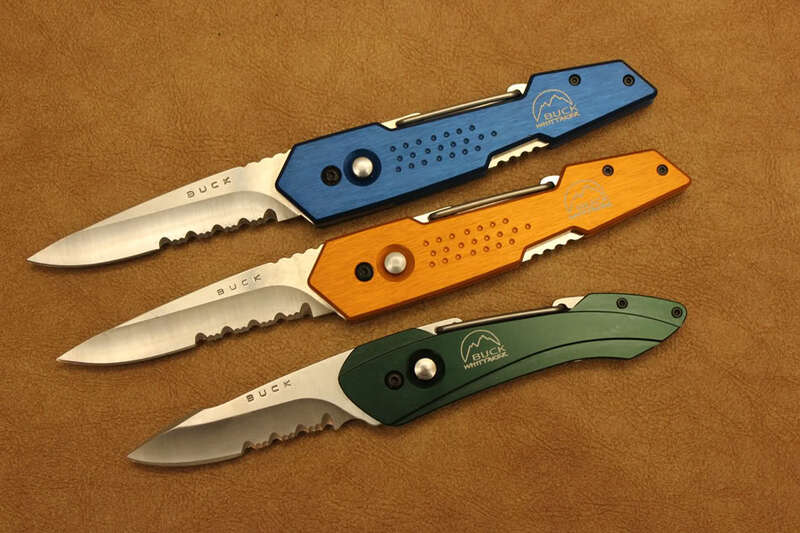 Revolution-XT was a collaboration between Buck and mountaineer Pete Whittaker. It was half fixed blade and half folder. The handle itself was a sheath when closed and a carabiner allowed the knife to be attached to nearly anything. They’re pretty good knives that just didn’t appeal to the masses for some reason. 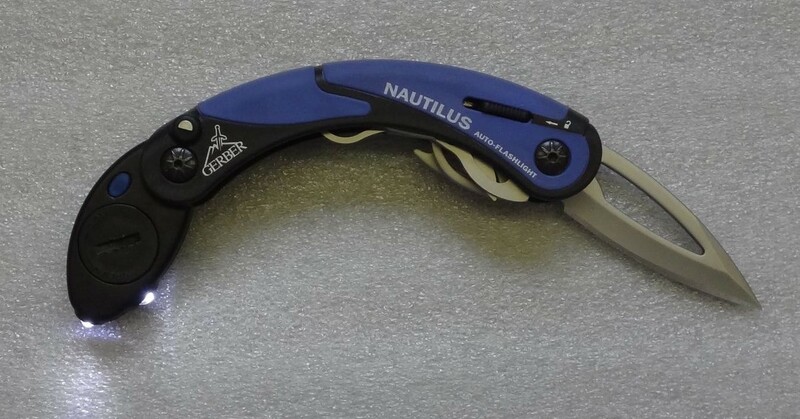 The Gerber Nautilus was an ugly-looking multitool that had some cool features. The curved tool had a spring-loaded flashlight with a few modes as well as scissors, screwdrivers, bottle opener, and one-handed opening blade. All the tools locked open too, which was a welcomed feature. The curved design was described as ergonomic, but it just looked uncomfortable. This is the start of a trilogy of innovative knife winners from Kershaw and Grant & Gavin Hawk. 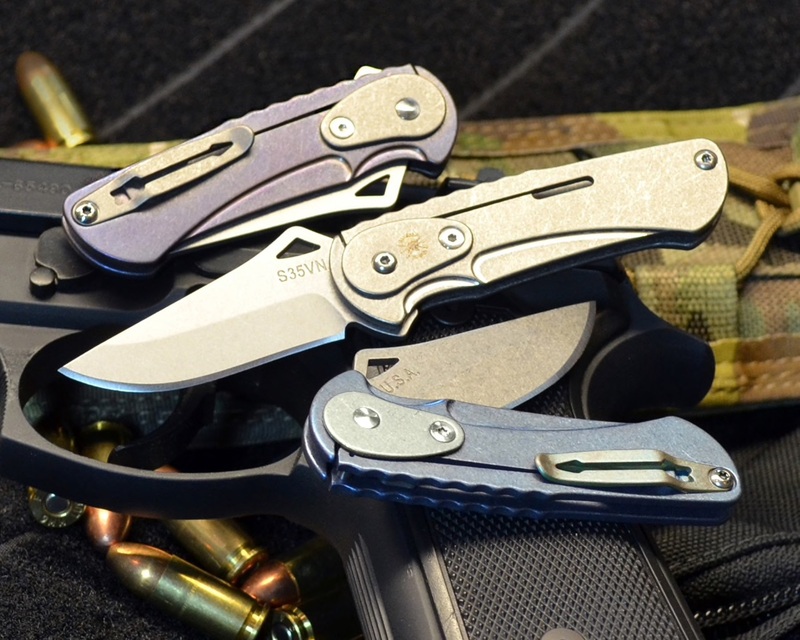 I’ve covered these three models extensively elsewhere, so I won’t go into too much detail, but the Kershaw E.T. is called the External Toggle after its unique opening mechanism. There are a handful of ways to open the blade with this system. Although it is not the most practical design, it does showcase the ingenuity of the Hawks. 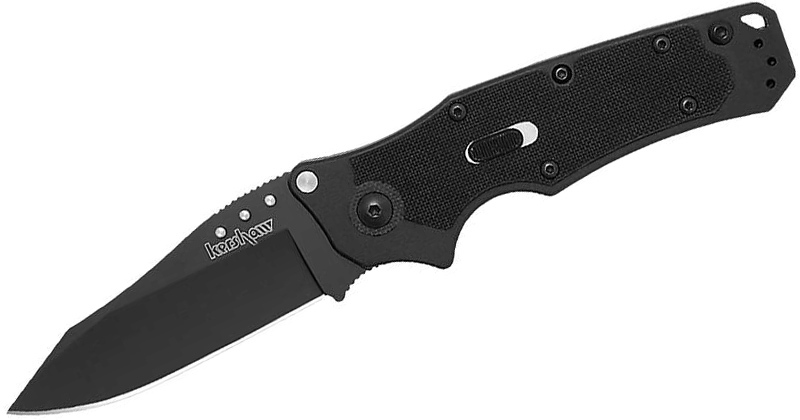 Zero Tolerance, a company under the Kai umbrella with Kershaw, teamed up with the Hawks to bring their renowned M.U.D.D. design to the masses. The M.U.D.D. stands for Multi-Utility-Dirt-Defiant, which is apt because the completely internal mechanism means you can dip this knife in mud and gunk and have it work flawlessly. This knife is discontinued, but the M.U.D.D. is still alive in some mid-tech and custom versions. The RAM — another Hawk design — stands for Restraint Articulated Mechanism and has a Hawk Lock like the M.U.D.D. Over the years people have raved about just how smooth and buttery the action on this thing is. 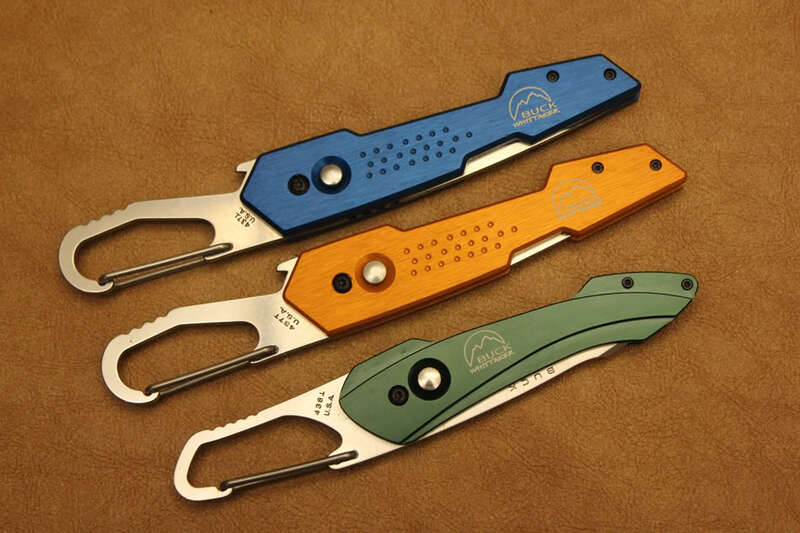 It feels like an assisted opener but that’s just the Hawk Lock. This is discontinued but parts of the RAM are still alive in the Kershaw Induction. 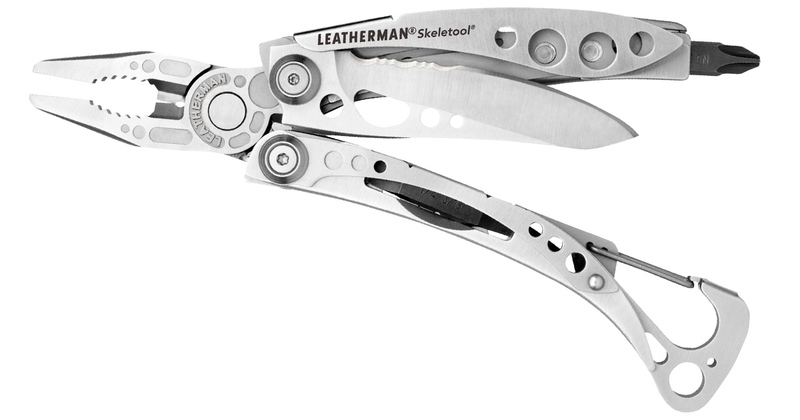 The Skeletool took the pliers genre and made it cool for everyday carry. The knife is a pared down version of the Leatherman with a new look that I find more ergonomic. This knife is alive and well and even comes in several different styles. At the time, the hype for the Skeletool was pretty high, and since it met expectations, it was a no-brainer pick for most innovative. This is another knife I wasn’t able to find on the internet, so again Blade helped me out. It is reminiscent of the SwingBlade series or the Buck Revolution-XT. 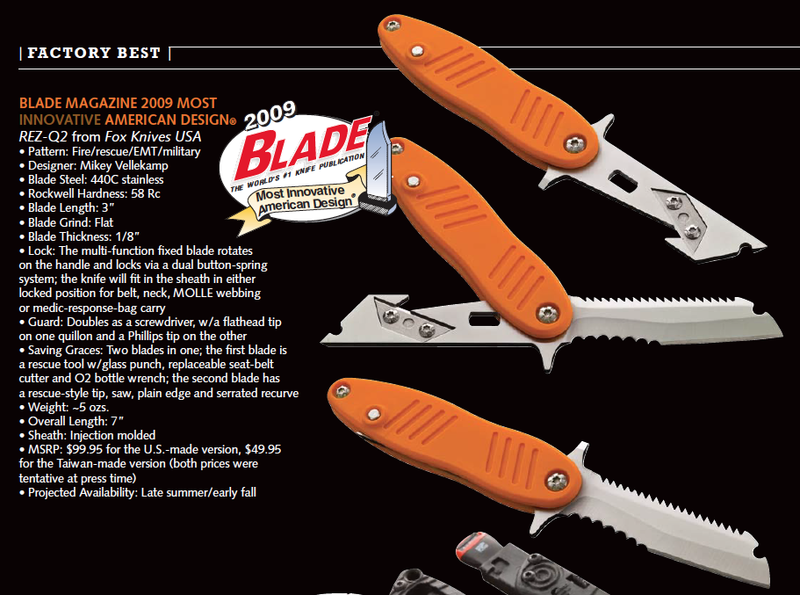 It is designed by Mike Vellekamp and has a dual-locking blade you can rotate. There are a ton of tools in this thing, including screwdrivers, blades, glass punches, saw, seatbelt cutter, and more. 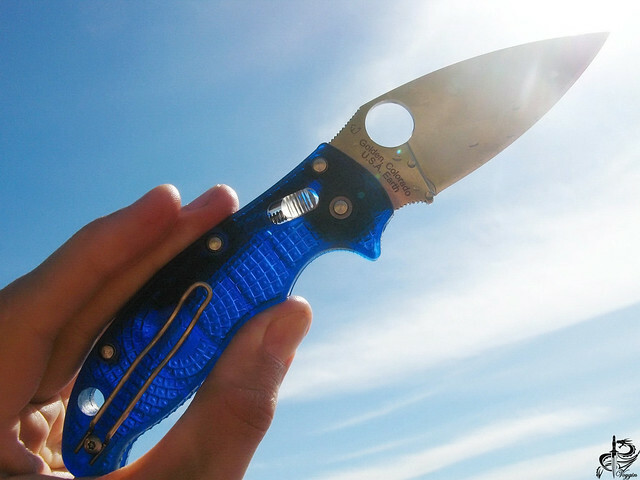 The Spyderco Manix 2 Blue Lightweight, sometimes called the Manix 2 in Blue Translucent Handles, was an innovative knife at the time because of its all-plastic handle scales. The scales meant the weight of the knife was cut down to a mere 3 ounces, down from the nearly 5 ounces of the G-10 Manix. Despite the plastic scales, this knife is very functional and dependable. 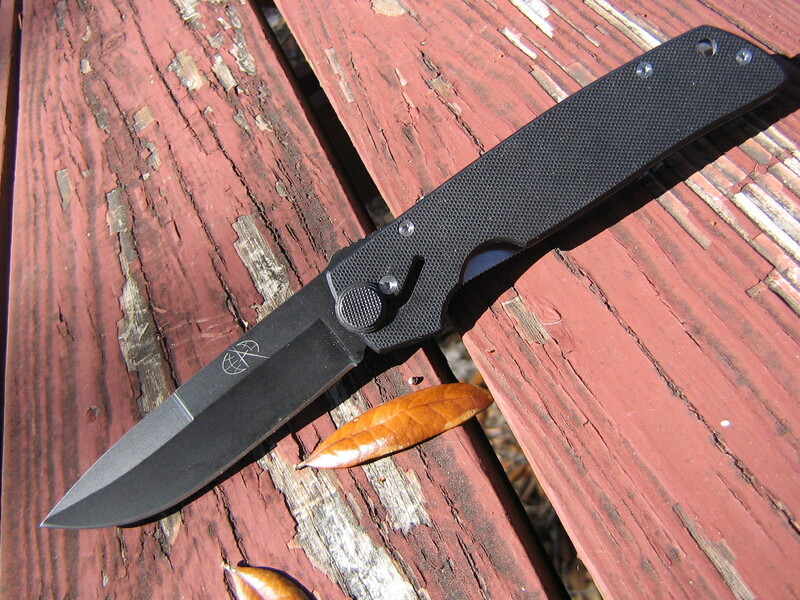 The Microtech Select Fire was an interesting design that came in a dual action or manual action version. In the dual action version, you could turn it into an automatic folder or a manual folder by turning a key that rendered the auto button useless. 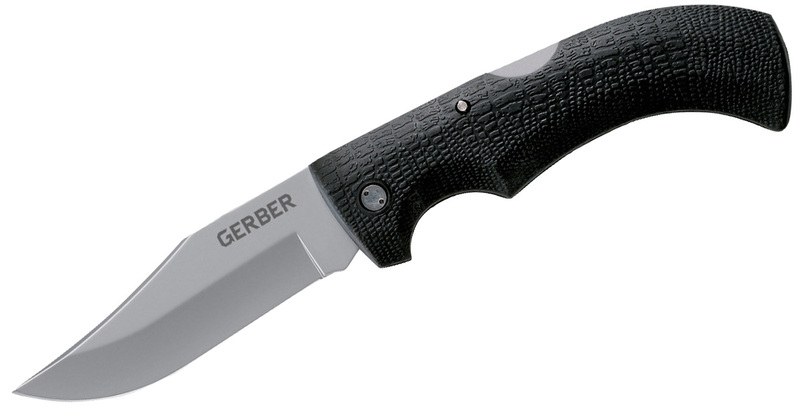 On top of that neat feature, the knife was well-designed and garnered a lot of praise from the knife community. The Autonomy was born out of a design challenge to Spyderco from the Coast Guard. They needed “a high-performance knife that could be easily deployed with only one hand while wearing heavy gloves, is impervious to salt water, could be easily maintained and, above all, would cut with extreme authority.” Thus, the Autonomy was made. 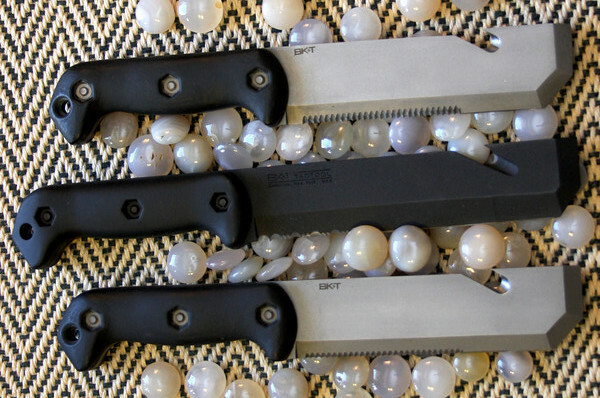 The knife was called a groundbreaking achievement in the automatic knife field. 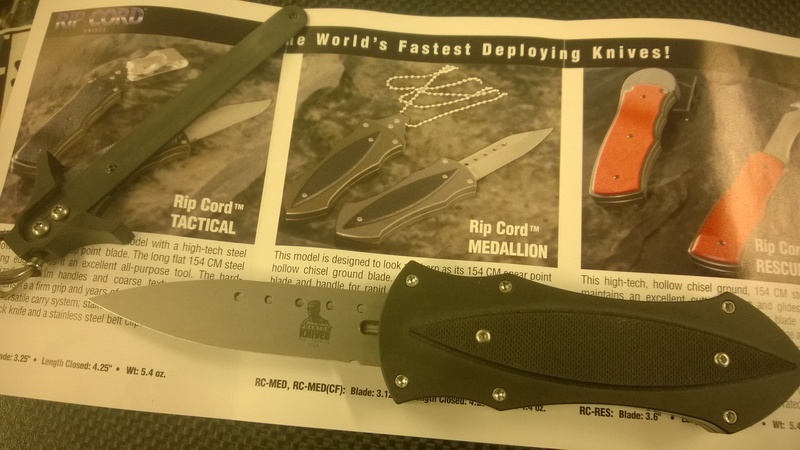 I’m on record saying the Microtech Death on Contact Killswitch is an awful name for a knife. 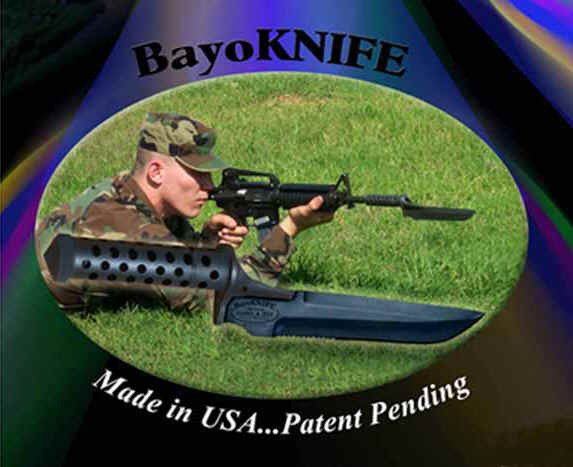 Still, that doesn’t make this knife any less innovative. The original Death on Contact was a flipper, I believe. 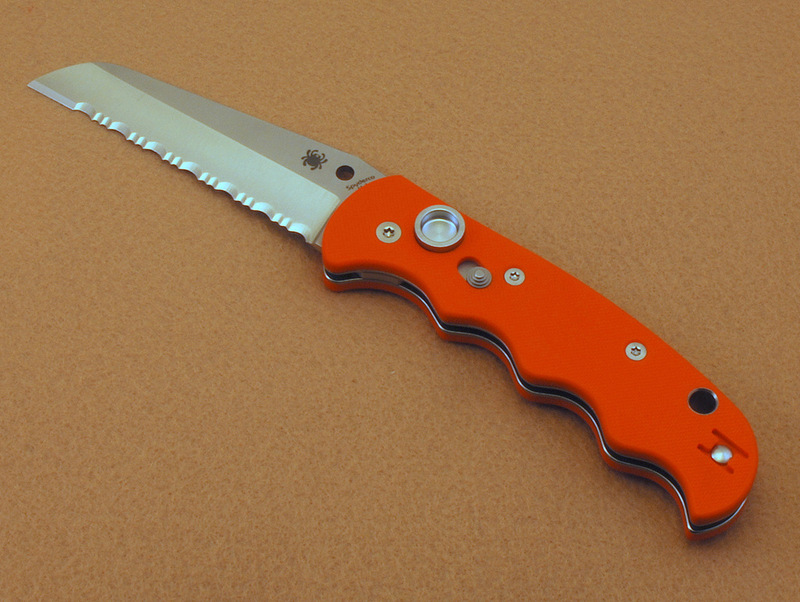 However, the Killswitch added a new element to the knife. The automatic button is locked when the killswitch is turned one way. When it’s turned the other way, it’s good to fire. 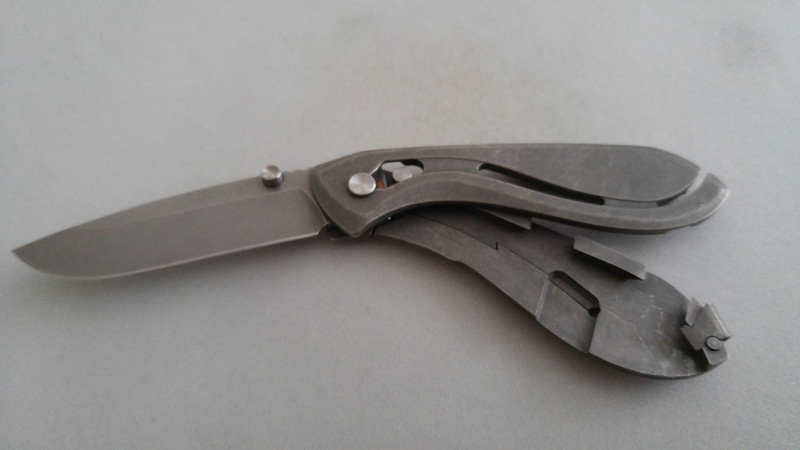 The conceit of the Spartan Nymph was to make a slipjoint without so many moving pieces. The result was an integral slipjoint that reminds me of the now discontinued Spyderco PITS. Here’s how, according to Spartan: This folder eliminates the need for a back spring by using what we call an “Integral Frame Slipjoint”, the dorsal side of the frame is cut to work as a spring and holds a pin that creates a bias to close and open. 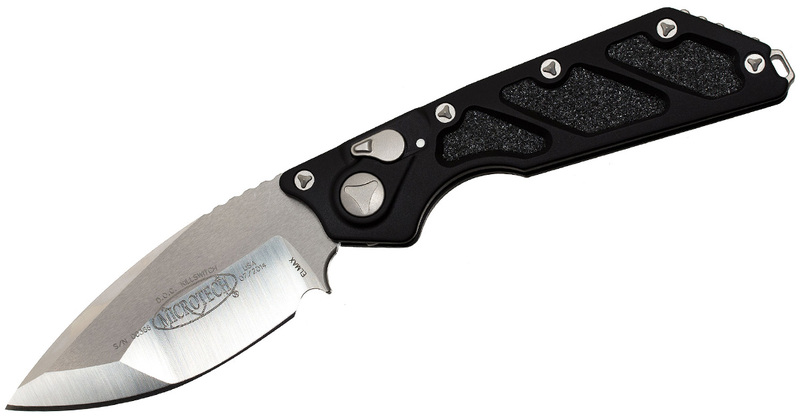 The Zenaida is the original CRKT Homefront, except for higher-end knives. This knife was constructed entirely without screws and could be disassembled completely without any tools. The design, along with the fit and finish, made this knife a winner. I don’t think Koenig makes this knife anymore unfortunately. The CDHK (Cold Dead Hands Karambit) was designed by Mandiola Defense Solutions, LLC & Mike Vellekamp Knife & Designworks. 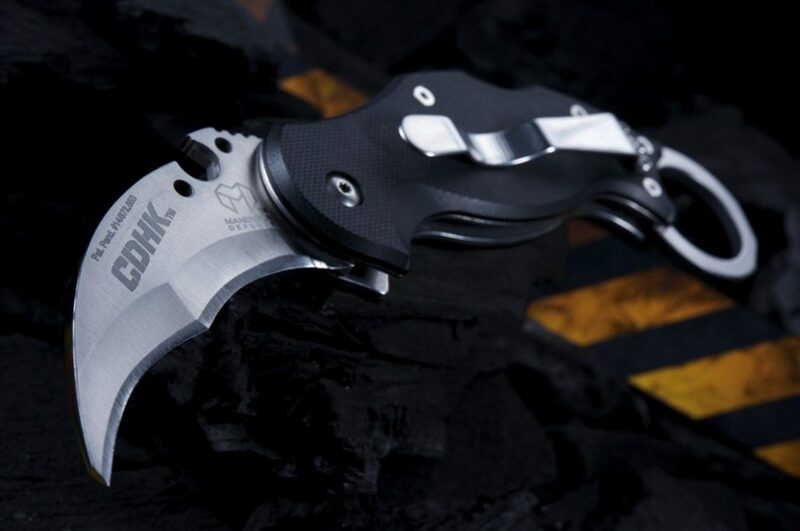 This knife is seen as more of a multitool karambit/self-defense tool packed with a ton of features, including a patent-pending vex drive tool attachment that goes on the blade and a window breaker karambit ring. 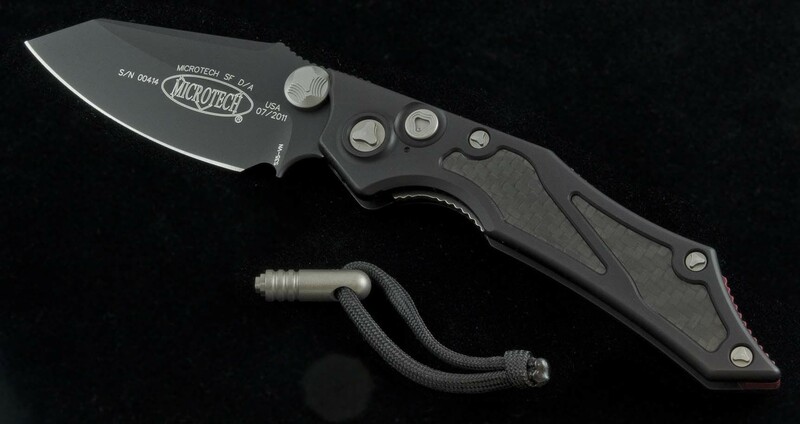 The Tighe Breaker Integral Automatic is the first integral automatic knife. 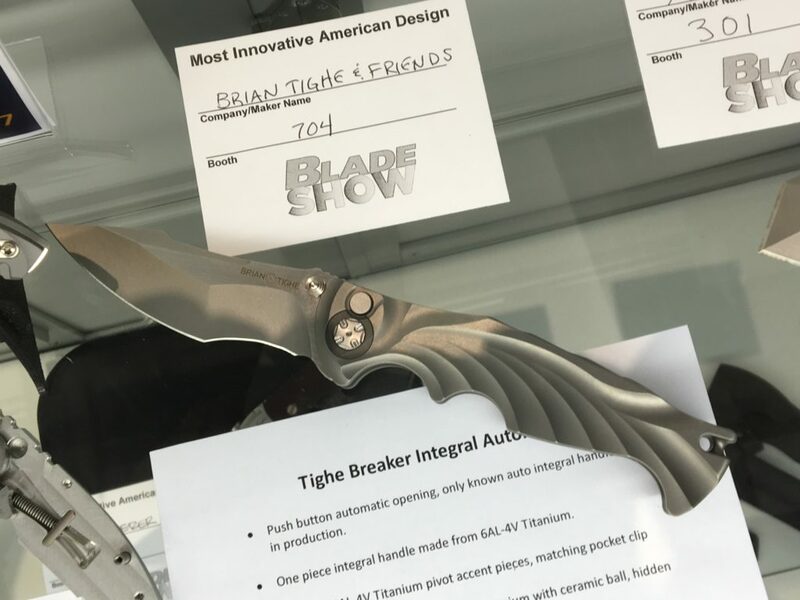 This Brian Tighe design is made from a single piece of titanium and can be had in either manual or automatic. It uses a button lock mechanism and is downright amazing to look at. “Death On Contact” is a worse name than “Hitman, but I wouldn’t carry either. Wouldn’t want to tell a policeman that was the model name of my knife. What a great article. I had forgotten about a few of these, which over the years we take for granted. It’s always nice to see makers and manufacturers push the envelope and come up with something innovative. Feels like these days there is too much focus on types of steel and materials and we’ve sort of been putting out too much of the same. I was the manufacturing engineer for the SpeedTech Synergy project. The “company” was a collaboration between Jim O’Young’s ‘Speed Option’ brand and True-Tech Corp, a silicon valley machine shop. 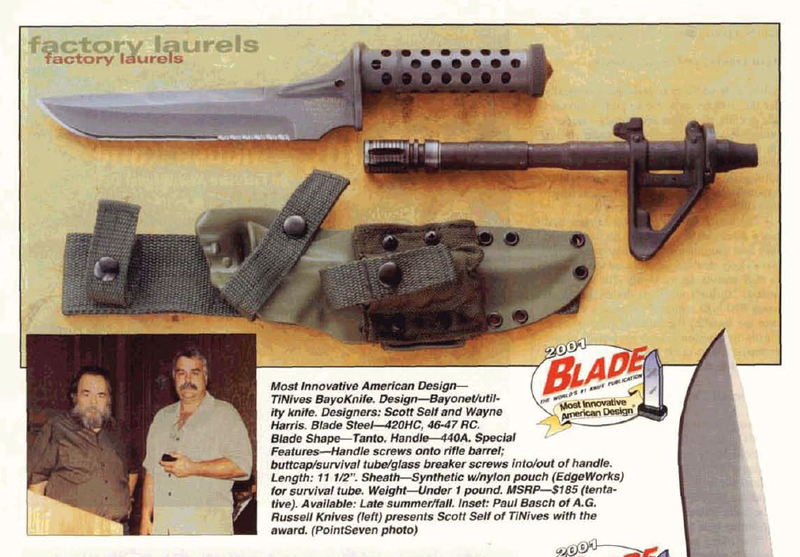 The one piece handle was the main novelty and it won “Most Innovative Knife” at the SHOT show in ’99. It was a fun project but not a money maker even at $300+ which is why it shut down after a limited run. The tricky bit was holding tolerance on the saw cut down the middle of the handle for the blade. A few .0001″ was the difference between butter-smooth and a piece of junk. I’m not sure there has been a knife like it since. I’ve still got a one of a kind prototype with a funky lime green handle. Still butter smooth!